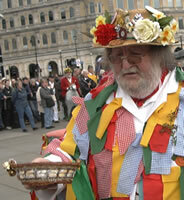 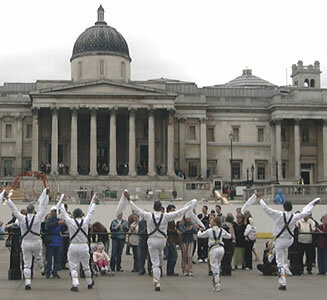 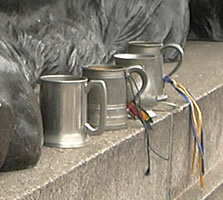 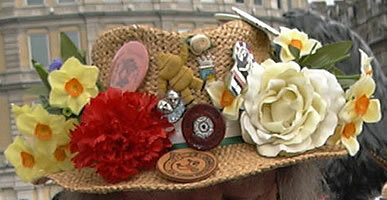 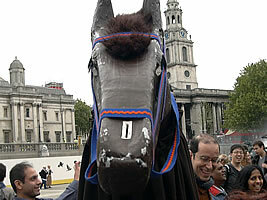 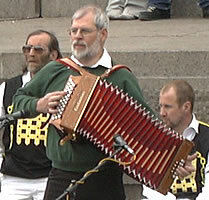 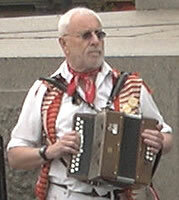 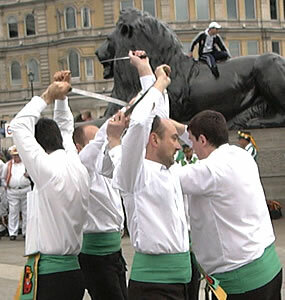 Morris dancing traditions: day of dance in trafalgar square (london, england). 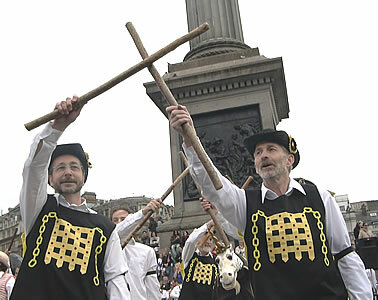 Photos from Westminster Morris Men's annual "Day of Dance"
Morris dancing is an English tradition which is more than 600 years old. 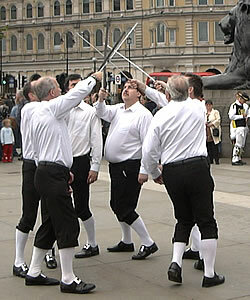 There are several different styles which have developed in different parts of England. 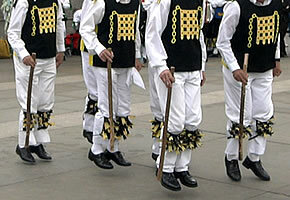 In the Cotswold tradition (originating in central England) the dancers dress in colourful costumes. 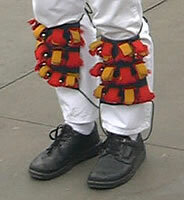 The most common combination is: a hat decorated with flowers, a white shirt covered by a tunic, white trousers, bells below the knees, and black shoes. 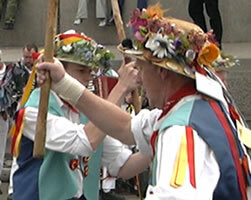 Dances may involve handkerchieves, wooden sticks and hand clapping. 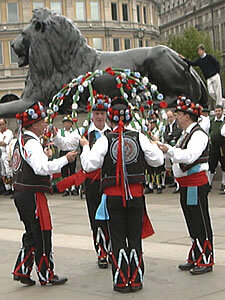 In the Border tradition, dancers blacken their faces. 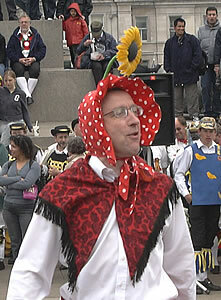 This was originally done as a disguise - Olvier Cromwell banned morris dancing because it was a form of begging. 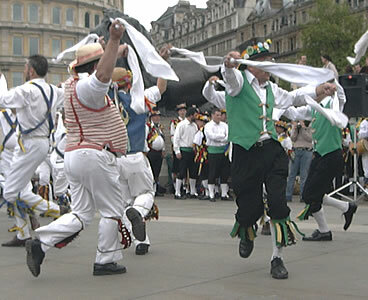 The dancers wear mainly black top hats with pheasent feathers - making fun of the village Squire and the Gentry. 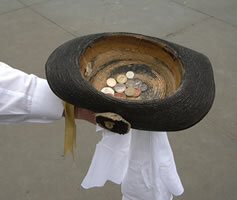 Their coats have rags sewn to them because the poor farm labourers usually only owned one coat and could be easily recognised without the rags. 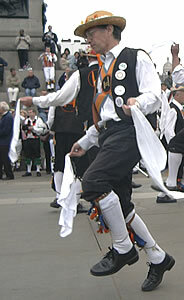 Rapper dancing is a style which developed in northern England - the dancers use metal blades called rappers. 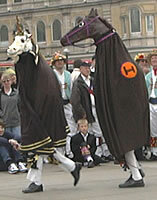 Morris dancers are usually accompanied by a Fool (a comic person) or an Animal (often a horse) who helps to entertain the audience and to collect money. 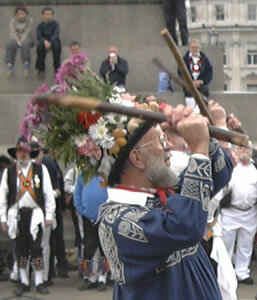 The event shown below included only groups of male morris dancers, but note that there are also many mixed and women's groups. 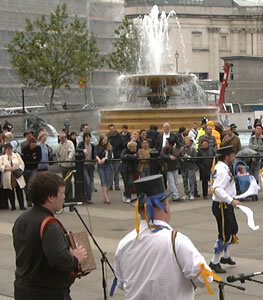 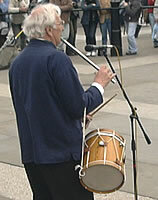 The photos below were taken in May 2003 on a special Westminster Day of Dance in Trafalgar Square, organised by Westminster Morris Men. 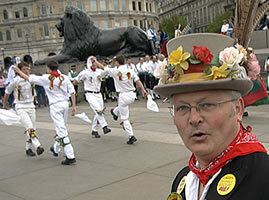 In total, almost 200 members of morris clubs from different parts of England performed in this event. 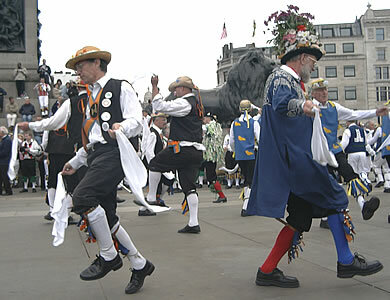 This Day of Dance usually takes place in various locations in the Westminster area of London on the second Saturday of May. 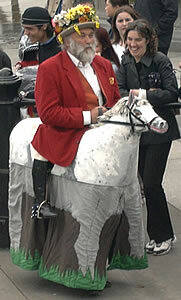 ... rode the two hundred ! 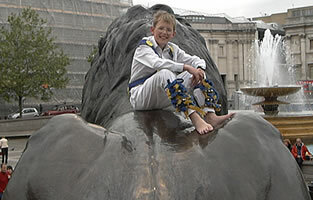 ... and perform somersaults ! 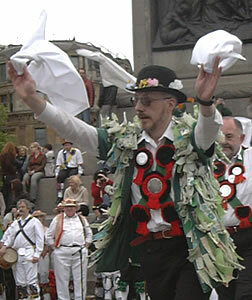 A square Morris ring ? 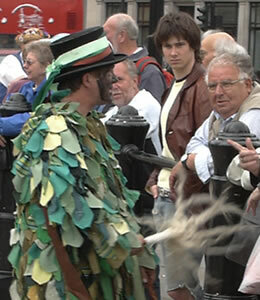 ... and mind your fingers ! 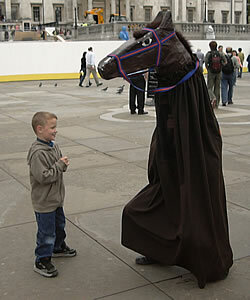 Anyone have a cold ? 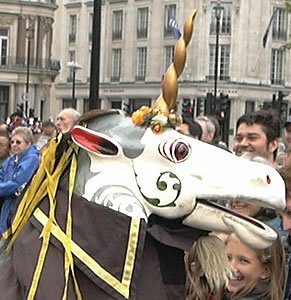 ... and young women too! 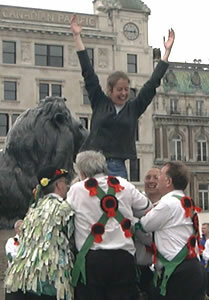 The event shown above was organised by Westminster Morris Men: http://www.westminstermorris.org.